Martin Gierke in this one, while Grace Wild made the doll. "This is the 2003 Santa Clara Vanguard's "smallest fan." It was made for age-out Tom Gierke after his last season in the pit. It's based on a German steiff doll that started out as a baseball player. 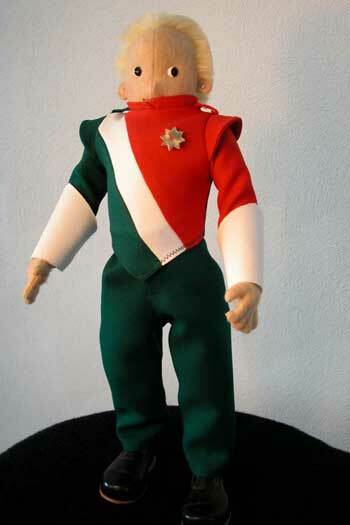 It uses the actual fabric worn by SCV on the field, and the pose reminds me of the way they all looked before each show. SCV and their "smallest fan" are one of a kind!"